The Mirabell Palace and its gardens have been one of Salzburg’s top tourist attractions for decades—not least because they famously starred in The Sound of Music. Maria and the von Trapp kids dance around its Pegasus Fountain in the movie, singing “Do-Re-Mi.” But you don’t have to be a fan of the musical to enjoy Mirabell. Listed as a UNESCO World Heritage Site, the baroque palace is easily one of the most stunning landmarks in the city—and one of the most popular wedding sites, too. The best thing about it? It’s totally free, so you can visit again and again. The Mirabell Palace dates back to 1606. Prince-Archbishop Wolf Dietrich von Raitenau built it to impress his beloved mistress Salome Alt. And it seems the palace, in its early days called “Altenau,” did the trick: The daughter of a Jewish merchant is said to have had 15 kids with the Prince-Archbishop! However, the happy family days came to a sudden end when Wolf Dietrich was overthrown and imprisoned. He died behind bars in 1617. His nephew and successor Markus Sittikus wasn’t quite impressed with Wolf Dietrich’s secret love nest. He renamed the palace to “Mirabell,” a compilation of the Italian words “mirabile” (admirable) and “bella” (beautiful) and tried to get rid of its “immoral” reputation. Between 1721 and 1727, Archbishop Franz Anton von Harrach hired Baroque architect Lukas von Hildebrandt to remodel it. On April 30, 1818, the palace was largely damaged by a town fire. Most of the frescoes were destroyed, but the great marble staircase and the Marble Hall remained undamaged. Peter de Nobile, court architect and director of the School of Architecture in Vienna, gave the palace its present neo-classical appearance. 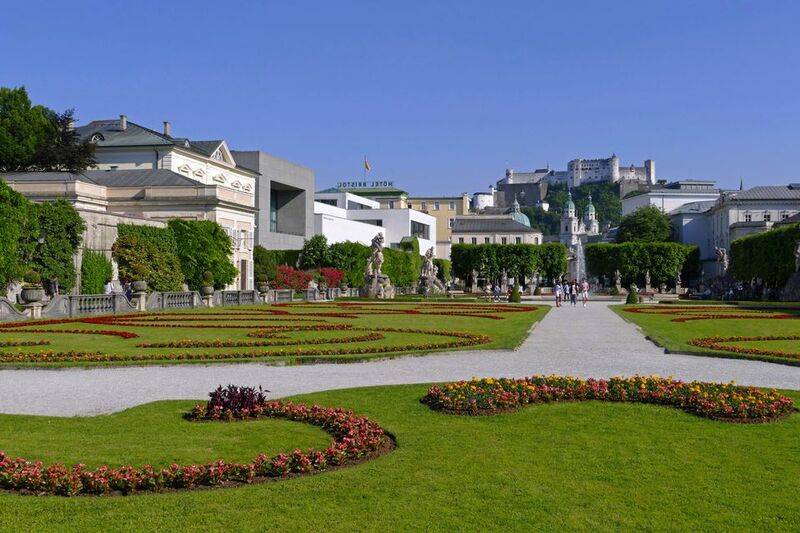 Nowadays, the Mayor of Salzburg uses Mirabell as its office while the Marble Hall is regularly attracting couples to “tie the knot.” The pristine gardens serve as a recreational area for locals and tourists alike. Marble Hall is undoubtedly the most popular site in Mirabell Palace, but the “Donnerstiege” (“staircase of thunder”) leading to it, is a Baroque gem on its own. Gaze at the numerous sculptures and paintings while making your way up. The Marble Hall itself, formerly the banquet hall of the prince-archbishops, is full of playful angel statues and excessive stucco work. Widely considered one of the most romantic wedding halls in the world (if you want to marry here, plan at least a year or two ahead! ), the grand hall also hosts Mozart concerts almost every night. The composer himself performed here regularly together with his sister, Nannerl. In the southern part, you will find the castle’s chapel. Re-modeled after the fire of 1818, it strikes with round apsis, a vaulted ceiling and Baroque statues of the Saints Augustinus, Rupert, Virgil and Martin. The altar dating back to 1722 is the only artifact that survived the flames. While the palace’s interiors are impressive, many find its gardens even more striking. Redesigned by Johann Ernst von Thun in 1690, its geometric form, typical for the Baroque, is visible until today. Bring your camera (or iPhone), as the numerous colorful gardens offer excellent photo opportunities. One of the highlights is the earlier mentioned Pegasus Fountain, designed by Austrian artist Kaspar Gras, featuring a sculpture of the famed horse. Get your selfie taken in von Trapp style before making your way through the rest of the garden. While the Rose Garden (also known from The Sound of Music) is one of the most romantic spots in Mirabell, the Dwarf Garden, created in 1715, is the oldest of its kind in Europe. Most of the 17 statues were modeled after dwarves who served as entertainers to the archbishop. The Hedge Theater in the Western section is used for performances during summer and the Orangery as a palm house all year round (a perfect spot to dry up on a rainy day!). Mirabell Palace is situated on the Eastern banks of the Salzach River, only a short walk from the historical centre. The entrance to the Mirabell Gardens is next to the Landestheater (Schwarzsteinstraße 22). The Marble Hall is open from 8 a.m. to 4 p.m. on Mondays, Wednesdays and Thursdays, and from 1 p.m. to 4 p.m. on Tuesdays and Fridays (except when there are weddings obviously). There are classical concerts almost every night, tickets starting from 32 euros. Book in advance! The Gardens can be visited daily from 6 a.m. to dusk. Come early in the morning or an hour or two before closing time to beat the crowds. Note that the Dwarf Garden and the Hedge Theater are closed in winter. Entrance to the palace and the gardens is free of charge. Salzburg’s most popular sights are all just a short stroll from Mirabell. Cross the Salzach and you will find yourself right in the middle of the bustling historical centre. The number one attraction is Salzburg Cathedral, an early baroque basilica famous for its bulbous copper dome, its twin spires and the font where Wolfgang Amadeus Mozart was baptized. Just around the corner, you can hop on the funicular to Hohensalzburg Castle (or walk up). The fortress atop the Festungsberg features stunning interiors, three museums and breathtaking views over the city. Afterwards, check out Getreidegasse, Salzburg’s most famous street full of fashion and chocolate stores. Don’t leave without stocking up on the yummy “Mozart balls”.